Current LTO-7 technology supports storage compressed capacity of up to 15TB and tape drive data transfer rates of up to 750MB. Hewlett Packard Enterprise, IBM and Quantum, all suppliers of Linear Tape-Open (LTO)-based storage products for the media and entertainment industries, have announced the specifications of the latest LTO Ultrium format, generation 8, which is now available for licensing by media manufacturers. The LTO Program, in which these companies and others are participating, also released a new LTO technology roadmap that details future specifications up to 12 generations of tape technology, extending the total capacity of data held on one LTO Ultrium generation 12 tape cartridge to 480TB. That’s an increase of 32 times the capacity of current LTP- 7 cartridges. 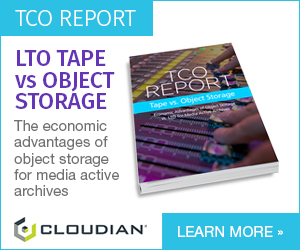 The consortium of companies said that in an effort to push the innovation boundaries of tape technology going forward, the current LTO format required a recording technology transition that supports capacity growth for future LTO generations. Addressing the technological shift while maintaining affordability in times of extreme data growth, the latest LTO generation 8 specifications are intended to be only backwards compatible with LTO generation 7 cartridges. The new LTO generation 8 specifications are designed to double the tape cartridge capacity from the previous LTO generation 7, with customers now being able to store up to 30TB per cartridge when compressed. The new LTO technology roadmap details future specifications up to 12 generations of tape technology, extending the total capacity of data held on one LTO Ultrium generation 12 tape cartridge to 32 times more capacity than current LTP- 7 cartridges. LTO generation 8 specifications will continue to include features introduced in previous generations such as multi-layer security support including hardware-based encryption and WORM (Write-Once, Read Many) functionality. Additionally, the partitioning functionality that allows users to present an easy to use tape-based file system with the use of LTFS will be also included. Alongside the launch of LTO Ultrium generation 8 specifications, for customers who purchase new LTO generation 7 cartridges, a new initialization feature will be introduced to enable the cartridge capacity to be increased by up to 50 percent. New LTO generation 7 cartridges initialized as LTO-8 Type M media will be able to store up to 22.5TB of data. 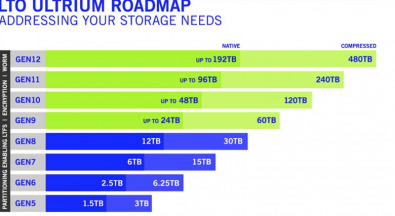 Together, these features are expected to provide users with a cost-effective storage solution that is both easy-to-use and addresses numerous storage needs. Current LTO-7 technology supports tape cartridge storage compressed capacity of up to 15TB and tape drive data transfer rates of up to 750MB. At less than a penny per gigabyte, LTO generation 7 technology continues to serve customers in the media and entertainment, digital video surveillance, government video and data storage verticals with positive consumer feedback across the board. The LTO Ultrium format is a scalable and adaptable open tape format developed and continuously enhanced by Hewlett Packard Enterprise, IBM Corporation and Quantum Corporation (and their predecessors).Additional information on the LTO Ultrium generation 8 specifications and the capability to increase new LTO generation 7 media capacity will be available later this year. Ultrium tape mechanism and tape cartridge interchange specifications are available on a licensed basis. Learn more about LTO technology here.